I was intrigued by this post from Tomek which has links to a prototype of an application built with Silverlight but using WebSockets. 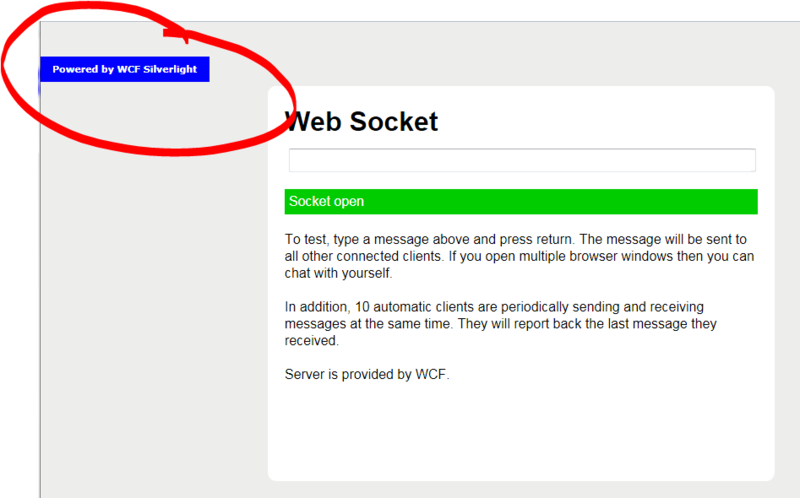 because Chrome has support for WebSockets already and so the sample switches out the Silverlight functionality. 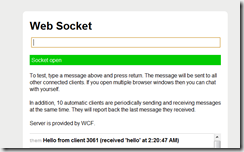 If you’ve not read about WebSockets then there’s a starter here and info on the protocol up here. Connection stays open during lifetime of communication. Client and Server send stuff any time they like in a full-duplex manner. So, traditional sockets are great in that they allow full duplex comms such as when the server wants to notify the client that something has happened but they’re not so great in that they require an open connection which tends to limit your server side scalability. They’re also not so great when it comes to crossing boundaries that only allow HTTP on port 80 or 443. Client (generally) disconnects as soon as that response comes back. and so HTTP is a great use of sockets in that it makes the model a lot more scalable by not requiring a permanent connection between the client and the server and server-side state but, because of that lack of connection, you can’t have the server notify the client of something because, generally, the client and server have no connection at any particular point in time. Now, of course you can use HTTP in various ways to try and give the illusion that the server does have a connection to the client and that’s normally done by just having the client poll the server on some period essentially asking “Do you have anything for me right now?” with the expectation that the answer from the server will frequently be “no”. So, a server wanting to “notify” a client simply has to put its notification data into a database and wait for the next time that client polls when it will be able to deliver the notification. There are even special HTTP tricks around this such as the “long polling” trick where the client polls on some frequency but holds the HTTP connection open longer than it usually would in the hope that during the lifetime of the connection the server will find that it has something it wants to push to the client and will send it down the already open connection. Clearly, there’s a balance here between how frequently a client polls and how long it keeps that connection open when it does poll. These sort of techniques are sometimes known as Comet and this idea of “long polling” is built into the WCF Polling Duplex implementation that can be used from Silverlight applications. As an aside the place where I’ve seen interest around this kind of functionality is from developers building financial apps who need low latency on server-driven data change notifications. Client makes HTTP connection over (e.g.) port 80/443. Client’s request uses a combination of Connection/Upgrade header to request “WebSockets”. If the server understands that (and it may well not today) then the client and server now can keep the socket open and send data back and forward to each other as they require. Data flows at UTF-8 with markers so that the client and server can denote “start” and “end” of each message which I guess makes life a lot easier for the programmer who has to handle those messages. Naturally, there’s a whole tonne more complexity to it than that but that’s the essence. Then there’s the API that a browser might expose around this stuff which is documented up here – browser support for this is “mixed” at the moment hence Tomek’s example using Silverlight to “bridge” that gap. 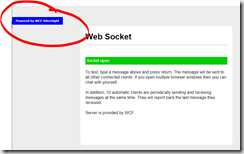 That is – this code will only run if the browser doesn’t support WebSockets already and what it does is to wire up window.WebSocket to something that implements the WebSockets API. 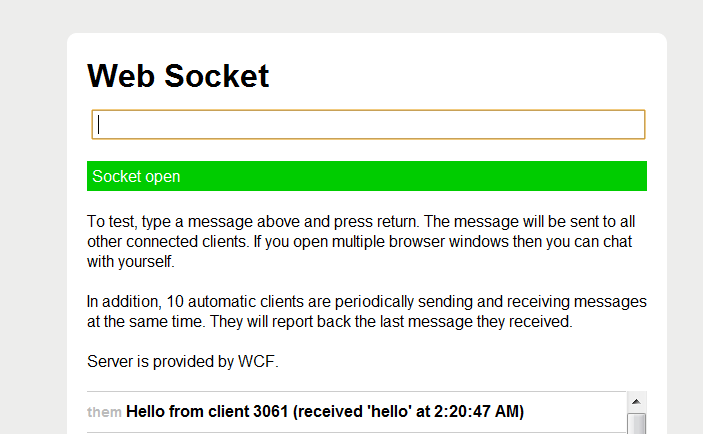 If the browser already support WebSockets then there’s no need for any of this. and offers the expected interface around Open/Close/Send and events OnOpen/OnMessage/OnClose and if you have a poke around in the SeventyFiveWebSocketProtocol class you’ll find it sending an HTTP GET with the relevant Connection and Upgrade headers and processing the server’s response. Plugging a cross-browser incompatibility in a really slick way with some Silverlight code – relying on Microsoft to test that Silverlight does the right thing cross-browser and cross-platform rather than waiting until all the browsers implement some feature (in this case, WebSockets). The only remaining “mystery” to me around this sample was what’s going on with the server-side as I’m not sure whether you could build a websockets server on IIS purely at the WCF layer. My first thought would be that it’d require some IIS support to get that going so I’ll need to ponder on that and perhaps ask Tomek whether he can explore a little more around what’s happening on the server side.